Droom Technology Pvt. 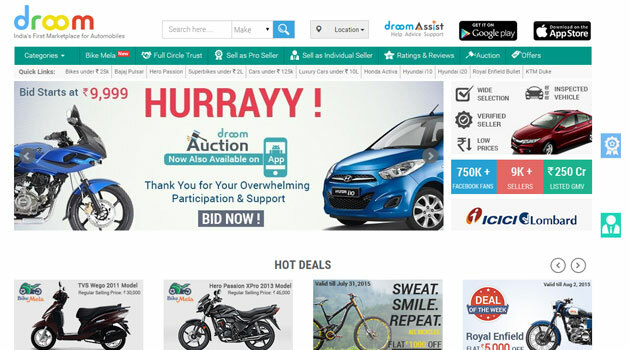 Ltd, which runs online marketplace for pre-owned automobiles Droom.in, has raised Rs 100 crore ($16 million) in Series A investment from venture capital firm Lightbox and Japanese e-commerce firm Beenos. Droom will use the money to venture into Southeast Asia and for expanding its Indian operations. "For our sellers, we provide low transaction cost, advanced online seller tools and scalable platforms. The recent investment from Lightbox and participation by our existing major investors allow us to aggregate the automobile industry at a scale which has not been achieved so far by anyone," Sandeep Aggarwal, founder and CEO of Droom, said. Aggarwal launched Droom in April 2014. Droom is Aggarwal's second venture after Indian online marketplace ShopClues, which too was backed by Beenos. Aggarwal successfully raised initial funds from a group of investors associated with ShopClues to launch Droom last year. Droom claims to have over 9,000 B2C sellers, 15,000 products, 6,000 listings, $85 million in listed GMV and over 500,000 downloads for mobile apps. The startup operates in 13 automobile categories. It claims to have completed over 3,000 transactions since its inception through the Android, iOS and desktop platforms. Droom has 85 employees in Gurgaon and Silicon Valley (the US). "Droom is disrupting an industry where user behaviour hasn't changed since the advent of the internet in the country. The added bonus for us is that we have worked with Sandeep in the past, know what he's capable of building and excited to be along for another ride," said Sid Talwar, Partner at Lightbox. The automobile market in India is worth $125 billion, making it the third-largest industry in the world with a demand for used vehicles spanning two wheelers to luxury cars. The pre-owned car market in India is worth $10 billion. However, 85 per cent of all pre-owned cars sold are sold through unorganised channels. It's estimated that about seven million used cars will be sold per year over the next 10 years in India. In the online space, Droom, competes with players such as Truebil, Zoomo, CarDekho (which acquired Gaadi.com), Carwale and CarTrade in addition to horizontal P2P platforms such as OLX and Quikr. Recently, Zoomo secured Rs 32 crore (around $5 million) in funding from existing investor SAIF Partners. Truebil had raised $500,000 (RS 3.17 crore) in its first round of funding from seed stage VC fund Kae Capital and angel investor Anupam Mittal in June this year.